How to Increase Yard Privacy (w/ or w/o a Fence) Baltimore Co. MD. Imagine it – you just bought a brand new home and are starting to settle in when you realize… your outdoor space has zero privacy. Maybe your neighbor’s kitchen window looks right out over your yard, or your deck is eye level with the house behind yours and backyard grilling turns into a staring contest. Maybe you have a pool and no fence to keep prying eyes away as you enjoy an afternoon swim. Privacy is important, but sometimes it gets lost in the shuffle when you’re considering how you want to utilize your outdoor space. Don’t let a lack of privacy steer you away from enjoying your yard. Here are a few tips on how you can make your yard more private with (or without) a fence. First things first. You might be saying to yourself, “But I have nothing to hide – why do I need more privacy?” Well, neighbors are only part of the equation. If you live in a neighborhood where the houses are built close together, prying eyes from other homes can drive you crazy when you’re out grilling, swimming, or just relaxing in the yard. After all, sometimes you just want to roll out a towel or blanket, kick back, and enjoy some time sunbathing. Or, maybe you live in a more commercial or urban area. Your neighbors don’t really bother you, when it comes to outdoor activities, but in higher traffic areas, the problem might come down to strangers taking an interest in what you’re doing. Having a private yard can go a long way toward being more comfortable in places where most of the people walking or driving by aren’t ones that you know or trust. Fencing can be a great way to improve the level of privacy that your outdoor space affords you. Taller wood and vinyl fences can create a visual barrier that closes off part or your entire yard to the outside world. They can also be a great tool when it comes to providing a safe space for young children or pets to play without needing constant supervision. Alternatively, aluminum fences can create a more open feel, at the cost of some privacy. To increase the amount of visual barrier provided, adding fence-friendly vines can create some additional green space without totally sealing you in. And if you’re just looking to delineate a small portion of your yard, smaller fenced-in sections may be an option to help create an adults-only area, or a more private place to garden. A fenced-in pool is also a great option to shelter you from prying eyes while swimming. 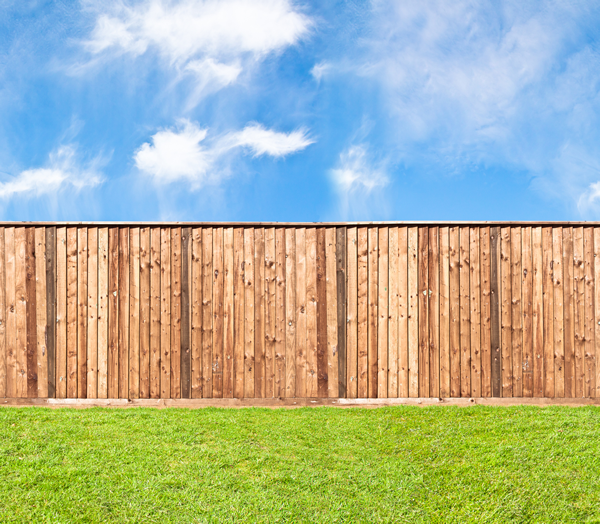 There are a number of reasons you might not want a fence on your property – perhaps your neighborhood HOA doesn’t permit privacy fences, or maybe you just don’t want to shell out the money to fence in your entire yard. Not to worry – there are other options to help create a more private outdoor space to enjoy. Planting large landscaping elements, like trees or bushes, can create a natural barrier (both visually and physically) to keep out unwanted guests and detract from unfamiliar observers looking into your yard. Permanent hardscaped features, like low stone walls or even heavy planters and urns can also create a physical boundary without sealing up your entire yard. Trellises and hedgerows take these concepts a bit further, and are essentially a step below a full-on fence; the downside to these features is that they can look somewhat dull when the plant elements are out of season. All in all, your home is your castle, and that includes your outdoor space. Adding some privacy can help you to enjoy all of your space without fear of unwanted attention, and you have plenty of options to make this space yours. This entry was posted on Thursday, March 2nd, 2017	at 9:57 am	. Both comments and pings are currently closed.